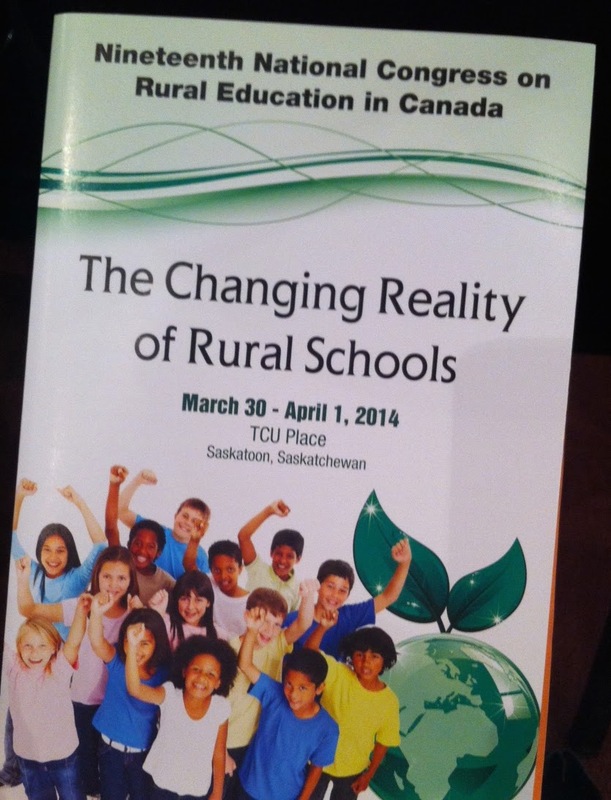 On March 30 - April 1, I once again attended the National Congress on Rural Education, held in Saskatoon, SK. I always enjoy this conference since it is an eclectic gathering that includes teachers, pre-service teachers, school and division administrators, trustees, and post-secondary educators. This year I was involved in two presentations. The first was along with a colleague and the senior administration of the Lakeshore School Division. My colleague (Dr. J. Kirk) and I have been working with Lakeshore School Division in a supportive research capacity during their efforts to renew education in their division through a project they call Re-Imagine Lakeshore. Brandon University is supporting these efforts through the SSHRC-CURA funded VOICE project. Exciting things are happening in this division! This presentation was well attended and the Superintendent, J. Martel was engaged answering many questions after the session. The second session was just me - I presented about my Ph.D. thesis research for the first time. It was good practice for my, hopefully soon, thesis defence. It was also good to go back over the research and boil down the findings to fit into a bit less than an hour, yet keep it interactive as much as possible. My session was fairly well attended and and the audience included several pre-service teachers as well as a mixture from the above categories. I think my session was well received and my colleague commented positively on my slides. I spent little time on the methodology and analysis and most on the findings - creating interesting slides to support the information was a challenge since I wanted to use participant quotes to support what I was presenting, but I think it turned out well. The presentation is embedded below. I am presenting on my research again this week at the Manitoba Teachers' Society (MTS) major conference, Awakening Possibilities, as well. The audience will be a little different again - mostly teachers in K-12 I suspect. The conference has some great presentations & keynotes, so it should be fun.